Burgers have a bad reputation for being too meat-heavy and full of fat, but this veggie-packed version will change all that! 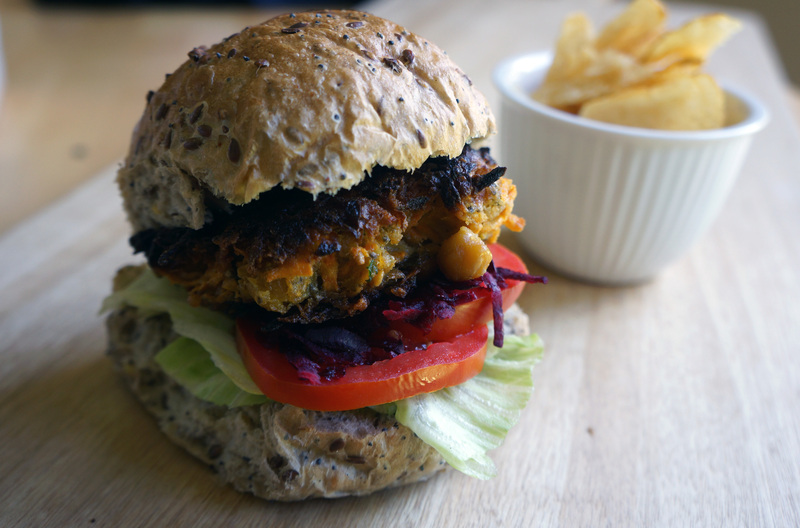 With plant protein from chickpeas and moisture from sweet potatoes, these burgers will make you forget meat altogether! They're gluten free too! Heat the oven to 200C. Place the chia seeds into a small bowl with 4 tablespoons water and stir well. Allow to sit while you continue with the recipe. Place the chickpeas, tahini, soy milk and sumac into a large mixing bowl and roughly mash with a fork. Leave some texture, it doesn't need to be all perfectly mashed. Add the grated sweet potato, parsley, chia seeds (which will now be a thick gel, this is used as a vegan binding ingredient in place of eggs) and rice flour and stir to combine. Form into six medium sized burger patties with damp hands, pressing them together so they hold their shape. Pan fry over medium heat for 3 minutes on each side until dark golden brown. Place into an oven-proof dish and bake for 10 minutes or until cooked through. Serve on burger buns with salad.